Sometimes access control can get complicated, and you never know what situation you’ll find yourself needing to add another door. 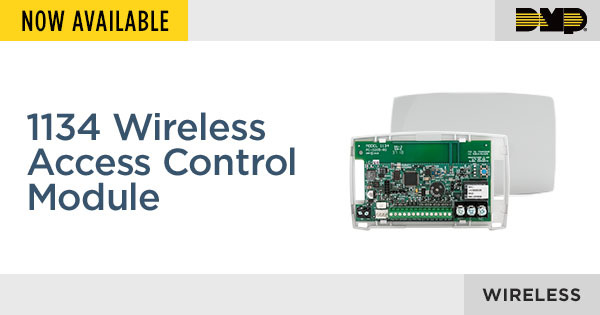 With the new 1134 Wireless Wiegand Module from DMP, you have the ease and flexibility to add access control in nearly any environment. For example, when adding access control to a gate or door that is not connected to the rest of the main building, DMP’s 1134 module performs the same functions as all of DMP’s 734 modules, all while using 900 MHz frequency-hopping spread spectrum DMP Two-Way™ Wireless to communicate with the control panel. The 1134 Wireless Wiegand Module allows you to use the powerful built-in access control capability of DMP panels that provide access control, arming, and disarming using proximity, mag-stripe, biometric or other Wiegand-output readers. Like each of DMP’s 734 modules, the 1134 allows you to program up to seven different card formats in addition to the DMP card format. This greatly expands your flexibility to easily use a format that your customers are already using without replacing existing cards. Plus, all user codes and credentials can be encrypted, when enabled in the Panel. An onboard relay providing a 10 AMP Form C relay contact for lock control. Four onboard zones that can be programmed for a variety of burglary or access control applications. An onboard programmable piezo provides local annunciation at the 1134 module. You can also connect a variety of switched ground annunciators to the 1134 for remote annunciation. Three indicator LEDs. The RELAY (Red) LED turns on for the same duration as the door strike relay. The WIEGAND (Yellow) LED turns on for one second to indicate receipt of a valid Wiegand input. When the SURVEY button is pressed, the SURVEY LED indicates good communication with the panel. Add up to four 1134 modules to the XT30. Add up to seven 1134 modules to the XT50, XR150, or XR550. Locally programmable using a keypad that is plugged directly into the 1134 module. DMP’s 734 Wiegand modules have proven to be reliable performers over many years of experience in many thousands of installations. Combined with DMP Two-Way Wireless, the 1134 model is sure to become the must-have module in access control for large installations. For questions or more information, contact our Inside Sales team at InsideSales@DMP.com or 877-757-4367.